The efforts of the Udalguri district Mahila Kurmi Samaj to eradicate the growing country liquor dens in Udalguri has prompted the Udalguri Excise department to take quick action. Superintendent of Excise, Udalguri Pritam Baruah organized a public awareness meet on the growing culture of illegal country liquor consumption at Orang Laxmi Mandir premises in Udalguri on Tuesday. The meet was presided over by Baruah. President of Udalguri, Mahila Kurmi Samaj, Sarla Mahato who exhorted the women to join hands to curb the menace. In his speech Orang OC, Gagan Chandra Deka spoke on the 53(1),54,55 and 61(A) and 61(B) clauses of Amemdment Bill of Assam Excise Act, 2000 where the Section 53 (1), 54 & 55, which were bailable sections earlier, have been made non- bailable. He elaborated that section 53(1) deals with the matter relating to penalty for unlawful import, export, transport manufacture, possession, sale etc the provision for penalty under Section 53(1) has been made more stringent and made punishable for a term up to three years and with fine up to Rs 5 lakh. The Section 54 deals with unlawful possession in certain cases such as duty evaded intoxicants, etc. Penalty provisions for punishment under section 54 made punishable with imprisonment for a term up to three years and with fine up to Rs 5 lakh. The section 55 deals with penalty for altering or attempting to alter any denatured spirit that may be used for human consumption. Penalty provision under Section 55 made punishable with imprisonment for a term up to five years and with fine up to Rs 2 lakh. While the Section 61 – A and Section 61- B have been inserted making the consumption of alcohol in a public place punishable with fine up to rupees fifty thousand and imprisonment up to six months. The President of Mahila Kurmi Samaj expressed her dismay over the deaths and crimes in recent past due to the consumption of liquor by youngsters. The Orang unit of The All Assam Tea Tribes’ Students’ Association ( AATSA) also submitted a memorandum in this regard to the Excise officials. The Secretary of Orang unit, Kurmi Mahila Parishad, Debhari Mahato exhorted the Excise department to take stringent action against illegal liquor at the earliest. The organizations also threatened to launch protest rallies if the Excise department fails to act swiftly. The meet which was attended by members of various women organizations, student bodies, noted citizens of the locality exhorted the Excise department and Udalguri district administration to impose the sections of the new Excise bill on offenders. 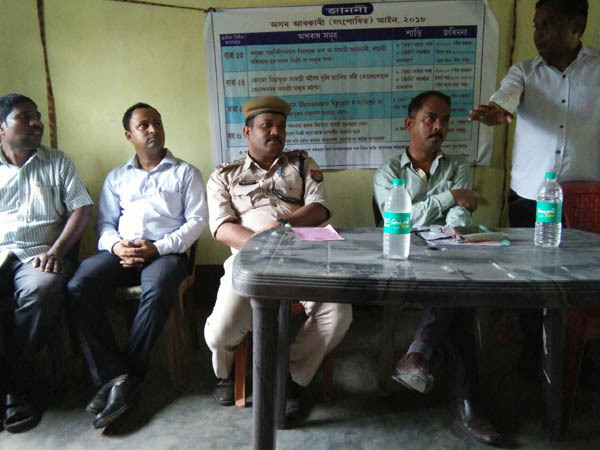 The Inspector of Excise, Udalguri, Prasanta Dutta assured the gathering of creating awareness on the new excise laws in the district and take stringent action after a fortnight .